This is a list of Firefox and Thunderbird extensions that have been tested in SeaMonkey after running them through the converter. This list is not complete – there may be many other extensions working fine after conversion so feel free to experiment with the converter yourself and let us know about the results. Adblock Plus Pop-up Addon extends the blocking functionality of Adblock Plus to those annoying pop-up windows that open on mouse clicks and other user actions. Help make Firefox better. The Add-on Compatibility Reporter enables you to report if the Firefox add-ons that you're using are working properly. Compatibility Notes: On AMO tagged as not available for SeaMonkey,Add-on Compatibility Reporter[converted] 2.0.6.1-signed installs without problems, but does NOT work for me after conversion with English SeaMonkey 2.45a1 (Windows NT 6.1; WOW64; rv:48.0) Gecko/20100101 Firefox/48.0 Build 20160308001946 (Default Classic Theme) on German WIN7 64bit: I do not see anything new in Add-Ons-Manager. Compatibility Notes: It can be forced to work somehow but is buggy and many features don't work. Use Mouse Gestures Suite instead. It has never been simplier to download videos from Youtube, Dailymotion and from most of the video streaming site. Just play the video, click on the toolbar, download and play it immediately in our integrated video player. Autofill Forms enables you to fill out web forms with one click. Remove or manage a new and uncommon kind of cookies, better known as LSO's.The BetterPrivacy safeguard offers various ways to handle Flash-cookies set by Google, YouTube, Ebay and others... Latest updates: See bottom link 'version history'! Compatibility Notes: Due to TmoWizard also Version 1.69 works fine with SeaMonkey 2.43 on unknown Operating System. BlockSite is an extension, which automagically blocks websites of your choice. Additionally, this extension will disable all hyperlinks to these websites, by just displaying the link text without the clicking functionality. BlockSite, improved and bugless. Try the companion mobile firefox extension BlockSite Plus mobile. Displays The build in Error Console in the bottom of Browser window. Encrypts traffic and unlocks sites. Facebook closed by an overzealous sysadmin? Browsec to the rescue! Browsec encrypts your traffic and routes it through our secure cloud. No one will be able to identify, track you or sniff your traffic. This add-on lets you print a webpage's area easily. Check4Change (aka C4C) is a simple extension that allows you to select a part of a web-page, and get notified when it changes. Tints browser tabs with a color specific to the website loaded. This helps you identify tab contents based on a distinct visual cue. Compatibility Notes: Be aware this is a very old extension and how well it works may depend on your theme and/or system. Brings a few (mostly tab related) features from older versions of Opera to Firefox. Adds a Close Tab (or Window, or Browser) button to the toolbar, so you can put it where you want it. The appearance follows your current theme. Add "Close Tabs to the Right" menu to tab context menu. Project is available on github, https://github.com/yukihr/CloseTabsToTheRight-FirefoxExtension . Compatibility Notes: You may be interested in converting RemoveTabs. Adapt page colors to your taste or need. Save your favorite color scheme for automatic coloration. Comes with 18 predefined themes and 24 basic transforms for hue, saturation, lightness and opacity. For Firefox 24.0 and above. CoLT (short for "Copy Link Text") makes it easy to copy either a link's text, or both the link text and its URL in a format you specify. This non-invasive extension simply appears as context menu items when you right-click a link. Fully customizable! Compatibility Notes: Some minimal functionality exists like being able to make the menu smaller, however other things are broken. Expands the context menu's 'Search for' item into a list of installed search engines, allowing you to choose the engine you want to use for each search. Cookie Monster provides proactive cookie management on a site or domain level basis, including 3rd party cookies. Via the status bar, it provides easy access to enhanced cookie functionality, while doing so in a non-intrusive manner. Compatibility Notes: Warning: newer version 1.3.5.5.1-signed is adware, make sure that you convert version 1.3.5.3.1-signed. Adds a "Copy Title" menu item to the pop-up menu. This puts the current page title on the clipboard. CTRL-V to pase. This addon will provide a way to copy title and url by using menu and context menu. Lets you customize the minimum and maximum tab width. Compatibility Notes: Note: this extension will not restore default widths on disabling or uninstallation. Adds toolbar buttons for enabling/disabling Xdebug debugging and profiling. The main goal allows users to open (and in some cases edit) page source with external applications. Compatibility Notes: View Source With menu does not work in Mail Compose window - but it's hard to treat it as an error because this extension is not event meant to work in SeaMonkey Mail or Thunderbird. However, in Mail Messenger windows the menu is functional. Set Default FullZoom Level, Toolbar buttons for Page zoom and Text zoom. Browser [Back] icon in browser navigation toolbar will no longer work if add-on is installed and active. Go up directory structure by click and key. Disables ephemeral Diffie-Hellman cipher suites that are vulnerable to the logjam attack. Displays Server Type, Headers, IP Address, Location Flag, and links to Whois Reports. Shows links to check server status and cache when page fails to load. The fastest (yet safe) addon to close tab using mouse only! Close any tab by double clicking the tab. Close current tab by triple click anywhere on the page. Optionally middle click or double right click on page to close tab. View and manage downloads from a tidy statusbar This is a new life in Firefox 26+ for old well-known addon Download Statusbar New Features: Replace Downloads Library page. Now you have full control of your downloads history! Copy links to a page with one click, ready to paste anywhere else, eg. emails, blogs, forums and Twitter. Copy a single page, all open tabs or all links on a page. This addon was built to make debugging while using netbeans PHP easier. Compatibility Notes: SM support is formally included but this add-on is very old and will benefit from conversion. There are some js errors in console but they seem to be harmless. A fully customizable pie menu for browsing the Web from where your cursor is located; a fork of easyGestures 4.3.2. Compatibility Notes: Most configurations work but there are a few actions that do not. This extension is made for a very old version of SM and will hence benefit from conversion. Compatibility Notes: Note: this and Exit Button Thunderbird will not cooperate together so choose only one. Allows to expire history older than a fixed amount of days. A customizable mouse gestures extension which enables to execute various commands and user scripts with six types of gestures. Compatibility Notes: Due to user grahamperrin's posting on Firefox & Thunderbird Add-on Converter for SeaMonkey (2017-11-18) this add-on installed and works fine for SeaMonkey with unknown Version, OS and language/localization. Compatibility Notes: Some problems with blocking YouTube HTML5 videos - see this discussion. Version 1.5.19a1 is still better than the official one. Stops flash autoplay and shows the video preview thumbnail. A stylized clock add-on for the status bar with a variety of display options, including flip clock, nixie clock, LED clock, and LCD clock. Compatibility Notes: This addon apparently supports some ancient versions of SeaMonkey but not the current ones. Convert with default options (despite warning) and it will work fine. Warning: using "analyze selection" from context menu more than once crashes the browser. Provides tools to find out details of the fonts used in a web page. Compatibility Notes: Page Info window will be a bit broken - convert without porting Page Info features (in options) to keep right-click context menu feature only without breaking Page Info. You may also be interested in converting Font Finder. Compatibility Notes: Context menu on the status bar icon may lack background. An add-on to perform free-memory operations without visiting about:memory. A virtual keyboard for Firefox. Adds a keyboard to the bottom of the window. Usefull for touchscreens or kiosks setups. Protect your privacy. See who's tracking your web browsing and block them with Ghostery. Compatibility Notes: On AMO tagged as available until outdated SeaMonkey 2.36 (max). Does not work at all for me with English SeaMonkey 2.45a1 (Windows NT 6.1; WOW64; rv:48.0) Gecko/20100101 Firefox/48.0 Build 20160308001946 (Default Classic Theme) on German WIN7 64bit: No ghostery Icon apears, preferences Ghostery page does not recognize installed Ghostery. A light-weight Google search toolbar for Firefox. Offers 14 search types, Google search suggestions (in 5.0+), search history auto-completion, a customizable toolbar, search word highlighting, and more. Compatibility Notes: Find next occurrence fails. Search history dropmarker does not work. Search history dropmarker does not disappear after disabling search history, it will highlight all the matching words in a page, though. Read more in this discussion. Grab content from web sites and feeds into an ePub / mobi file for your eBook reader. Create your own newspapers with news from all over the world. Compatibility Notes: Default script editor is not available - set up external editor in options to make the edit function work*. Otherwise it appears to work. You can also consider Scriptish, a GM fork, which supports SeaMonkey natively (use "Install Anyway" button if it appears as not available for SeaMonkey). Another alternative: Greasemonkey Port. *Update: In SeaMonkey 2.45 and later the developer tools are included therefore the internal editor will work (because it uses the Scratchpad, which is part of dev tools). No need to set up external editor. Therefore, Greasemonkey appears to be fully compatible. This places each day's entire browsing history in a submenu of the history menu. Add sub-menus to History Menu for previous days' history. Get rid of annoying cookie warnings from tens of thousands of 'infected' websites! Compatibility Notes: Right-click menu entry "Report a cookie warning" does not work. Pick images while you browse. Choose (filter) images and save images from web page to local disk. Single-click access to common actions for images (e.g. saving, copying, printing). This extension is intended to provide a replacement for the equivalent toolbar in Internet Explorer. Provides thumbnail, progress meter, or others to each tab. This is the official add-on for easier access to LEOs Online Dictionaries. Select any word or phrase, right-click on the selection and translate from/to English, French, Spanish, Italian, Chinese, Russian, Portuguese and Polish to/from German. Compatibility Notes: On AMO tagged as not available for SeaMonkey, LEO Dictionaries [converted] 2.0.0.1-signed.1-signed installs without problems and works fine for me with English SeaMonkey 2.45a1 (Windows NT 6.1; WOW64; rv:48.0) Gecko/20100101 Firefox/48.0 Build 20160308001946 (Default Classic Theme) on German WIN7 64bit. Lightbeam is a Firefox add-on that enables you to see the first and third party sites you interact with on the Web. Using interactive visualizations, Lightbeam shows you the relationships between these third parties and the sites you visit. Displays an icon in the tooltip or next to the cursor indicating the target of a link. Extracts all links from web page, sorts them, removes duplicates, and displays them in a new tab for inspection or copy and paste into other systems. Adds feed reading, notifications, favicons, and other enhancements to Live Bookmarks. Compatibility Notes: When live bookmarks are added to bookmarks toolbar then this extension will not work in most cases. However, it will work fine in the bookmarks menu. A quick restartless magnifier to debug styles and web pages. Compatibility Notes: Generally appears to work, however after the selected memory limit is reached it starts throwing js errors in console, hence this extension may have some hidden issues in SeaMonkey. Adds icons to your Firefox menus. Choose from the built-in icon sets or import your own. Ultra Compact Mouse Gesture Extension. Ultracompact Mouse Gesture Extension. Special Tab control Edition. Add, modify and filter the HTTP request headers sent to web servers. This addon is particularly useful for Mobile web development, HTTP testing and privacy. Navigate up one or more URL levels, by clicking on icon in URL bar, or using icon's context menu, or pressing shortcut key. 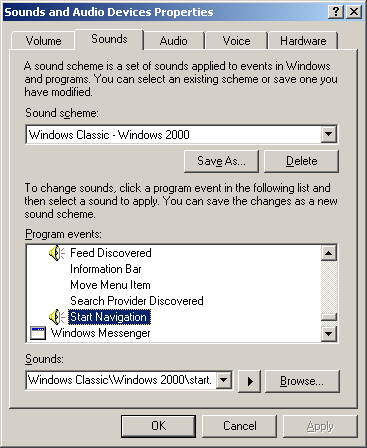 A simple extension that plays the Windows Internet Explorer start and end navigation sounds, popup blocked and information bar sounds, feed and search provider discovered sounds, and download completed sound. Compatibility Notes: Tested on Windows XP with SeaMonkey 2.33.1. Windows 8+ users will need to assign the "Start Navigation" sound. Adds a toolbar button which opens a new blank tab when clicked. The "NewScrollbars"-extension replaces the default scrollbars of Firefox and Thunderbird with colorized ones (partly) known from "Noia themes". Firefox 32 zoom bug with custom scrollbars got fixed in Firefox 33 beta 6, Aurora and Nightly! Shows an icon in the tab of each tab currently playing an HTML5 video or audio. Clicking on the icon mutes the videos/audio. This feature has been implemented in Firefox Nightly builds, but you can have it now. Compatibility Notes: Does not detect Flash, otherwise works fine for html5 audio. Norwell reveals the history that is otherwise hidden from you in native firefox history viewer. Displays all browsing history chronological/sequentially as timeline. Advanced search, wildcards and filters. Chrome and Firefox history import tool. NoSquint allows you to adjust the text-only and full-page (both text and images) zoom levels as well as color settings both globally (for all sites) and per site. Compatibility Notes: Only some of the features work in SeaMonkey. See this discussion on how to hack NoSquint for better compatibility. Integrates location bar and search bar into one. Shows search and url suggestions. Quickly switch search engine using search keywords. Provides different auto-complete popup styles for compact displays. After you installed this addon to your Firefox, bookmarks are opened in new tab always. Loads links in new tabs, by conditions. Compatibility Notes: Due to TmoWizard Version 1.0.2016011401 works fine with SeaMonkey 2.43 on unknown Operating System. Zoom in, zoom out, and reset page zoom with one toolbar button (saves toolbar space). Zoom by clicking on the button, or by rolling the mouse wheel. Save an image of a web page (including Flash content) to a file. Web page screenshots may be captured interactively or from the command line. Options allow you to control the output format (PNG or JPEG), image file name, scaling, and much more. Bring back your personal and powerful Firefox Button! It adds some options to launch easily other profiles and the Profile Manager. Combine URL bar and progress bar. Create a QR Code of the selected text or current URL. Use CTRL-SHIFT-Q to quickly see the QR Code. Also possible to create a QR Code from free text within Firefox. Works completely offline! Now with UTF8 support. Encode selection, links and images to QrCode with right-click. Search from the context menu using any installed search engine. Allow, block or prevent third-party images from loading via button in the Status Toolbar or alternatively add a button to the Navigation Toolbar. Ever needed to restart Firefox after enabling or disabling an extension, switching to a new theme, or modifying configuration files (such as userChrome.css or user.js)? This simple extension adds a "Restart Firefox" item to the "File" menu. You can also use the Ctrl+Alt+R keyboard shortcut, or the included toolbar button. Compatibility Notes: Due to TmoWizard also Version 1.1.6 works fine with SeaMonkey 2.43 on unknown Operating System. Quick lookup in Wiktionary and Wikipedia, without the need to open a new tab. Just right-click a word while shift / ctrl / alt is pressed. NOTE: Reddit Enhancement Suite is developed independently, and is not officially endorsed by or affiliated with reddit. RES is a suite of tools to enhance your reddit browsing experience. Compatibility Notes: On AMO tagged with "FF only", unknown add-on-version did not work after conversion due to dmellem with unknown SeaMonkey version on unknown Operating System. Remove tabs on the left/right side of selected one. Compatibility Notes: This extension appears to be adapted to SM and can be installed without conversion but still the conversion helps with some minor issues. Saves an internet link externally as a Windows Shortcut File, a UNIX Desktop file or a Mac Webloc file, optionally in user defined folders. Compatibility Notes: Toolbar button and extension menu items do not open sidebar - open sidebar normally with F9. Compatibility Notes: Due to user grahamperrin's posting on Firefox & Thunderbird Add-on Converter for SeaMonkey (2017-11-18) this add-on is NOT compatible with SeaMonkey with unknown Version, OS and language/localization. It's unknown what problems make this add-on unusable. Replaces vertical scrollbar with scrollable minimap. Google Search by Image: Use rightclick on an image to quickly find out the source of an image, how it is used, or find higher resolution versions via Google Reverse Image search. (Google Image Search is similar to Tineye Reverse image search). Lets you highlight search bar keywords in the current page via the context menu. Search within the current site from the search bar, the new search panel or the context menu. Search within current subdomain or within entire domain. Fully supports the new search panel and search engine buttons. Compatibility Notes: On AMO tagged as not available for SeaMonkey, the converted add-on installs without problems, but does not work at all with Server-Installation of official en-US SeaMonkey 2.50a1 (NT 6.1; WOW64; rv:53.0) Gecko/20100101 Firefox/53.0 Build 20170110004313 (Default Classic Theme) on German WIN7 64bit. Highlights your search terms in Web pages. Secure Login is an extension for Firefox integrated password manager. Fix the web. Gets rid of a site's cookies and LocalStorage as soon as you close its tabs. Protects against trackers and zombie-cookies. Trustworthy services can be whitelisted. Shumway is an HTML5 technology experiment that explores building a faithful and efficient renderer for the SWF file format without native code assistance. Simulates the smart zoom of mobile devices and tablets on desktop. Instead of double tapping though, click and hold. Allows you to listen the english text, selected in the web-page. Add-on converts selected text into the speech in OGG format. This format has native support by the modern Firefox versions. Try it now. Have Fun and Good Luck. Switch DOM Inspector to an over/under vertical layout instead of the usual side-by-side panel layout. Compatibility Notes: Works but there is also a version updated to work with SeaMonkey here. Undo close tab action seems to be missing. Tab Groups are an easy way to organize a lot of tabs. You can visually group related tabs, switch between groups, and quickly search through all of your tabs to switch to a specific one. Tab Mix Plus enhances Firefox's tab browsing capabilities. It includes such features as duplicating tabs, controlling tab focus, tab clicking options, undo closed tabs and windows, plus much more. It also includes a full-featured session manager. Adds a horizontal scrollbar below the tab bar when Firefox is in tab overflow mode (more than 10 tabs open) for easier tab navigation. Also gives a vertical scrollbar to the alltabs dropdown menu, when it is required. Open Bookmarks/History/Homepage/URL/Search in new tabs, and more utilities for tabbed browsing, including Protect/Lock/Faviconize/Unload Tab, Reload Every, Select and manipulate multiple tabs simultaneously, Tab Stacking/Coloring, etc. http://en.wikipedia.org/wiki/Text-to-voice. TTS gives Firefox the power of speech. Select text, click the button on the bottom right of Firefox window and this add-on speaks the selected text for you. Isn't it brilliant? Audio is downloadable. Save automatically the content in Textarea. Adds toolbar buttons for switching Xdebug remote debugging and profiling. Start/stop GIF animations through a keyboard shortcut or by clicking them. You can also restart animations from the beginning, or disable animations by default. You can toggle the find bar only with ctrl + F keys. Adds toolbar buttons to the customize toolbar window in several programs including Firefox, Thunderbird and SeaMonkey. Some of the buttons make commonly preformed actions quicker, others add new functionality. Compatibility Notes: this extension supports SeaMonkey natively since version 1.0.1 - no need to convert! TooManyTabs allows you to store as many tabs as you like by adding extra rows in the Firefox! It saves your browser's space and memory as idle tabs are put aside. The extra rows also help to better prioritize and visualize your tabs. Finden Sie sichere Shops in Ihrer Google-Suche. Highlights trusted shops in Goolge search results. The entire page will be fading to dark, so you can watch the video as if you were in the cinema. Tired of going to History -> Recently Closed Tabs just to undo a closed tab? Then this extension is for you! This extension allows you to undo closed tabs via a toolbar button or the right-click context menu. Monitors web pages for updates. Useful for websites that don't provide Atom or RSS feeds. Compatibility Notes: Only some of the blocking options work in SeaMonkey. Display URL in hyperlink tooltips. Easily viewable version info in the Firefox Add-ons Manager on Firefox 32.0 and later. Also restores the add-on version number on Firefox 40.0 and later. Compatibility Notes: You may also try Add-ons Manager - Version Number, which works in SeaMonkey without conversion. Compatibility Notes: Due to TmoWizard also Version 1.97.37.1-signed works fine with SeaMonkey 2.43 on unknown Operating System. Compatibility Notes: SeaMonkey is supported since version 20150421 - no need to convert. There is a suspect that WOT spies out users and sells user data without anonymization, for details see this video in German language. Web2PDF converter allows to convert web pages into PDF files directly from browser. It uses Web2PDF online service. Adds search engines from your search bar to the context menu. A very lightweight add-on that allows you to watch YouTube™ videos using Flash® Player instead of the default HTML5 player. The Flash® Player will consume less material resources (CPU, RAM) if your PC doesn't easily support HTML5 videos. Try it! YouTube Flash Video Player is a powerful tool that will let you choose Flash video player as default YouTube video player. Very useful for veteran Computers which have problems with HTML5 player. Adds a download button to YouTube. By clicking on it you can download the video as a high quality mp3 file. Simulates the smart zoom of mobile devices and tablets on desktop. Instead of double tapping though, click and hold to zoom on a paragraph, image, etc. The Next-Generation Research Tool. Zotero for Firefox lets you capture and organize all your research without ever leaving the browser. Compatibility Notes: The toolbar button does not work - set up keyword shortcuts (that do not clash with built-in SeaMonkey shortcuts) to access functions that would have been available from the toolbar like "Save to Zotero". Installation: copy the xpi link from the installation page to the converter. Allow you to add a Address Move Button to mail compose window. Provides keyboard shortcuts for filing messages into nine configurable "favorite" folders using user-defined keys. Also provides a simple filter system with a keyboard shortcut to file the currently selected message(s) into the correct folder. Extracts all attachments from selected messages and then can delete, detach or mark-read. Compatibility Notes: Some errors in console but seems to work fine. Adds blink feature to the new-mail alert. You can also disable auto-hiding of the alert. Compatibility Notes: On AMO tagged with "TB only", add-on version 6.3 works fine after conversion due to dlangton on unknown Operating System with unknown SeaMonkey version. Compatibility Notes: There's a tiny glitch at the reply button, see this post for a workaround. This extension is to display the warning dialog when you send mail for multiple domains. Color your Folder Treeview Icons! Allow you to help address sidebar more useful. A Thunderbird extension which disables drag and drop in the folder pane. This extension prevents unintended folder movement. Compatibility Notes: Note: this and Exit Button Firefox will not cooperate together so choose only one. Thunderbird email accounts, including contacts, connecting to Microsoft Exchange Web Services. Compatibility Notes: This extension is reported to work in SM but there are a few errors in the console so you may expect some minor things to be broken. Add arrow buttons for rotating among folder views, and switch to "All Folders" view when hovering over the folder pane during drag & drop. GlassMyBird enables more AeroGlass effects than the default Thunderbird theme (only possible on Windows Vista and 7 when AeroGlass is enabled). See instructions inside add-on description how to enable Glass on Windows 8. Follow up for Thunderbird E-Mails. Lightning or other AddOns are not required. Set a reminder by adding a label or by context menu and let mailmindr remind you. Compatibility Notes: Works fine but there may be errors in console. This extension for Thunderbird gives you some options about compose window and the headers layout in reply and forwarded mails. Compatibility Notes: Use version at http://removedupes.mozdev.org/installation.html without any conversion. This appends a ruler to the mail composition window. Automatically select the Inbox folder at startup, even if there is no account set to automatically check for new emails. Important: the author will provide no other update for this add-on. Compatibility Notes: The main function of opening Inbox works fine, however options for selecting messages are either buggy or do not work so keep them disabled. Adds columns to display Sender/Recipients mailaddress only. Extension to mimic Outlook Express Stationery. Allow you to use HTML files as templates for mail. Also allow custom template in replies or forwarded mail! Show only your messages received during the current day, the last 7 days or the last 30 days thanks to 3 buttons.You may use pin button to keep filters applied when switching to your other inbox/folders. Compatibility Notes: Toolbar buttons don't show.